“Ibrahim Anderson” is an Islamist Twitter propagandist based in the United Kingdom. He regularly accuses the United States and United Kingdom of terrorismIbrahim Anderson, Twitter post, August 2, 2015, 3:15 a.m., https://twitter.com/abumoieay/status/627784835407417344. while calling for replacing civil law with sharia (Islamic law). Anderson has posted on several occasions for man-made law to “go to hell.”Ibrahim Anderson, Twitter post, August 1, 2015, 7:23 a.m., https://twitter.com/abumoieay/status/627484685153779712. 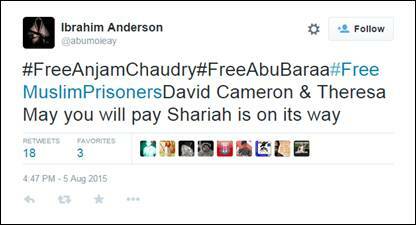 Anderson has not posted specific support for ISIS, but has retweeted several jihadist Twitter accounts, such as Anjem Choudary, Abu Haleema, and Mizanur Rahman. He frequently tweets condemnations of secular law, particularly relating to treatment of Muslims. He has called for the release of all Muslim prisoners,Ibrahim Anderson, Twitter post, August 5, 2015, 1:32 p.m., https://twitter.com/abumoieay/status/629027235836620800. including Choudary and Rahman.Ibrahim Anderson, Twitter post, August 5, 2015, 1:32 p.m., https://twitter.com/abumoieay/status/629027235836620800. Anderson declared in an August 6, 2015, post that pedophiles receive better treatment under the law than Muslims.Ibrahim Anderson, Twitter post, August 3, 2015, 2:05 p.m., https://twitter.com/abumoieay/status/628310826303258624. 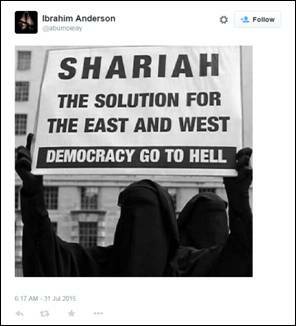 The only solution, according to Anderson, is sharia.Ibrahim Anderson, Twitter post, August 1, 2015, 7:21 a.m., https://twitter.com/abumoieay/status/627484330437267456. Muslims are subjected to raids and arrests “with out committing any crimes,” he writes.Ibrahim Anderson, Twitter post, August 3, 2015, 2:04 p.m., https://twitter.com/abumoieay/status/628310446550962176. 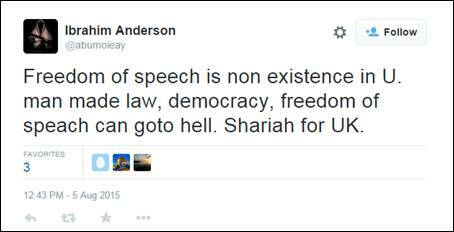 In one series of tweets in early August 2015, Anderson recalled his arrest and detention by British authorities. 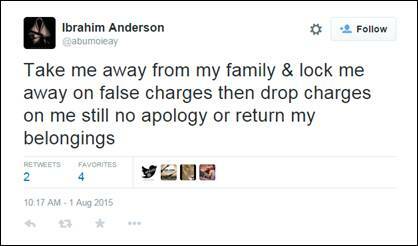 He was eventually released without an apology or the “return of [his] belongings.”Ibrahim Anderson, Twitter post, August 1, 2015, 10:17 a.m., https://twitter.com/abumoieay/status/627483212118392832. 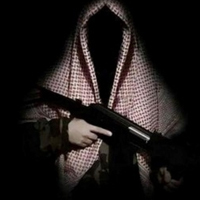 Anderson has also called British Prime Minister David Cameron and Home Secretary Theresa May terrorists,Ibrahim Anderson, Twitter post, August 5, 2015, 9:45 a.m., https://twitter.com/abumoieay/status/628970058367258624. warning that they “will pay” when sharia is implemented.Ibrahim Anderson, Twitter post, August 5, 2015, 1:47 p.m., https://twitter.com/abumoieay/status/629030893781389313. Anderson has accused the West of attacking Muslim landsIbrahim Anderson, Twitter post, August 1, 2015, 2:02 a.m., https://twitter.com/abumoieay/status/627403997817778176. and targeting Muslims—at the rate of hundreds per day—because of their faith.Ibrahim Anderson, Twitter post, August 1, 2015, 1:58 a.m., https://twitter.com/abumoieay/status/627403094465359872. He accuses the non-Muslims of thinking Muslim blood is cheap when, he says, “one drop of Muslim blood” is “sacred to Allah.”Ibrahim Anderson, Twitter post, August 1, 2015, 1:59 a.m., https://twitter.com/abumoieay/status/627403384761524224. @abumoieayIbrahim Anderson, Twitter page, accessed August 6, 2015, https://twitter.com/abumoieay. 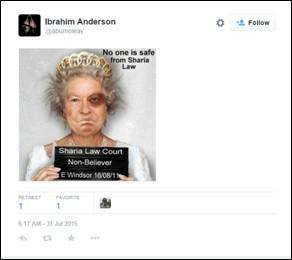 “Ibrahim Anderson” is an Islamist Twitter propagandist based in the United Kingdom. David Cameron & Theresa May you will pay Shariah is on its way” (Tweet)Ibrahim Anderson, Twitter post, August 5, 2015, 1:47 p.m., https://twitter.com/abumoieay/status/629030893781389313. “David Cameron & Teresa May biggest terrorists. Both can goto hell. Shariah for UK.” (Tweet)Ibrahim Anderson, Twitter post, August 5, 2015, 9:45 a.m., https://twitter.com/abumoieay/status/628970058367258624. #FreeMuslimPrisoners” (Tweet)Ibrahim Anderson, Twitter post, August 5, 2015, 1:32 p.m., https://twitter.com/abumoieay/status/629027235836620800. “So uk is more leaniant on pedos. Would rather have pedos in society than inocent Muslims.” (Tweet)Ibrahim Anderson, Twitter post, August 3, 2015, 2:05 p.m., https://twitter.com/abumoieay/status/628310826303258624. “You call Muslims terrorists think you need to start looking closer to home. UK & usa biggest terrorists” (Tweet)Ibrahim Anderson, Twitter post, August 2, 2015, 3:15 a.m., https://twitter.com/abumoieay/status/627784835407417344. “You attack muslim lands in the name of war on terrorism you need to be attacking camran & obarma” (Tweet)Ibrahim Anderson, Twitter post, August 2, 2015, 3:17 a.m., https://twitter.com/abumoieay/status/627785341043363840. “Stop killing & spilling the blood of Muslims or else don't cry & complain when it happens to you” (Tweet)Ibrahim Anderson, Twitter post, August 2, 2015, 3:18 a.m., https://twitter.com/abumoieay/status/627785556177645568. “Enemies of Islam of the muslims you need to withdraw ALL your troops stop bombing our brothers & sisters stop killing our children” (Tweet)Ibrahim Anderson, Twitter post, August 2, 2015, 3:24 a.m., https://twitter.com/abumoieay/status/627786928344199168. “You think muslim blood is cheap? One drop of muslim blood is more sacred to Allah than the karba & all its surrounding” (Tweet)Ibrahim Anderson, Twitter post, August 1, 2015, 1:59 a.m., https://twitter.com/abumoieay/status/627403384761524224. “Take me away from my family & lock me away on false charges then drop charges on me still no apology or return my belongings” (Tweet)Ibrahim Anderson, Twitter post, August 1, 2015, 7:17 a.m., https://twitter.com/abumoieay/status/627483212118392832. Shariah for uk” (Tweet)Ibrahim Anderson, Twitter post, August 1, 2015, 7:23 a.m., https://twitter.com/abumoieay/status/627484685153779712. “Any inovation in Islam not found in Qur'an or sahih texts is no part of Islam. No matter who is suggesting it or doing it.” (Tweet)Ibrahim Anderson, Twitter post, July 31, 2015, 4:18 p.m., https://twitter.com/abumoieay/status/627257064453210112.